I may have been, for example, the only kid who loved liverwurst (did not make me very popular in the fifth grade), Brussels sprouts (granted, I buttered and salted them to death back then) and cottage cheese. And I’ve always felt bad for these hated foods. In more recent years, however, I have found redemption in the fact that Brussels Sprouts are like totally all the rage. OK, I know it’s still hard to find someone who loves cottage cheese beyond having to eat it for dietary reasons and I highly doubt that I can bring liverwurst into favor – do they even make it anymore? But, one out of three ain’t bad. 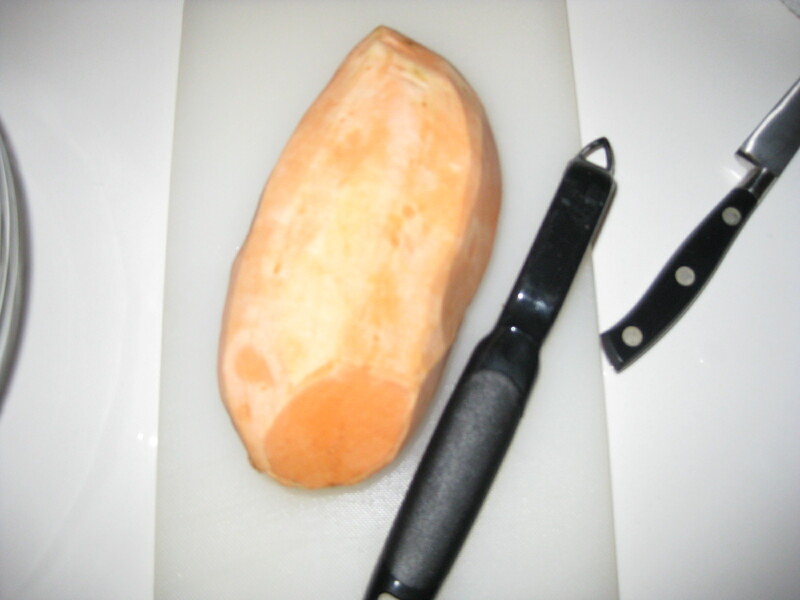 So, when I was working on Thanksgiving dinner a few years ago and people totally gasped when I wanted to make sweet potatoes, I was shocked. The first time, I was told that I could make sweet potatoes, but only if I did it ‘southern style’ – with a heap of sugar and melted baby marshmallows on top. The next time, it was only OK to include a sweet potato dish if I promised to make regular mashed potatoes and only if the regular mashed potato bowl was like four times the size of the sweet potato dish. I may have recently been given this as a directive for the upcoming Thanksgiving as well. I get it. Sweet potatoes are not that easy to love. They’re different, after all. But it is their difference that makes them so interesting…and, delicious. And, not just for Thanksgiving. Plus…they’re a superfood! 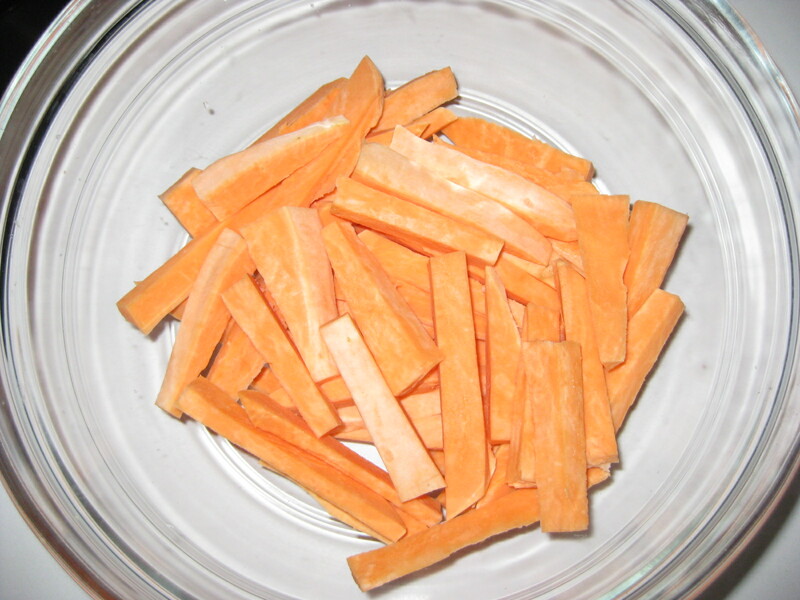 Sweet potatoes are high in fiber, Vitamin A, C and B6. Also they’re high in potassium and manganese. They can, according to Yahoo ‘help stabilize blood sugar…[and] they’re relatively low in calories’. WebMD recommends them and, as if that isn’t good enough…so does Doctor Oz! So stop with the hate and find a way that works to enjoy this delicious superfood. 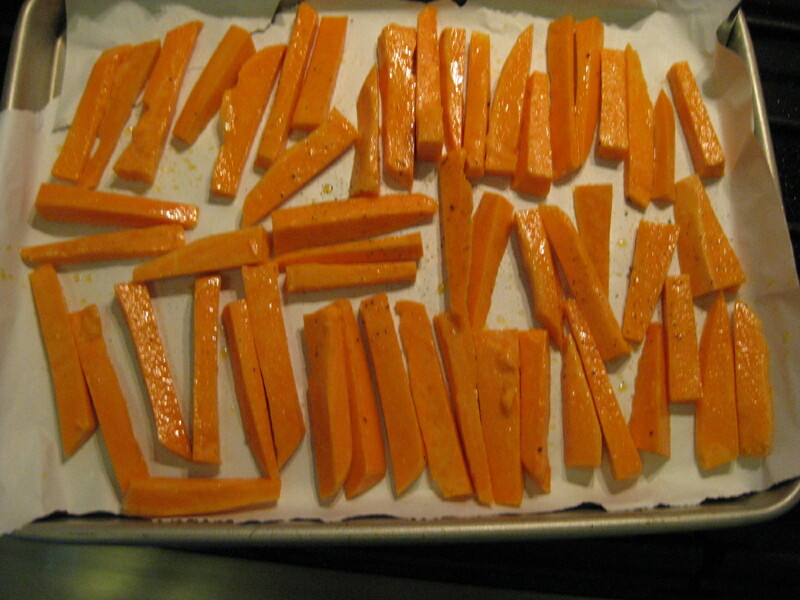 NOTE: getting the sweet potatoes peeled and cut into fry form is the hardest part. And, I’m a little klutzy with a knife. So have a sharp one and be careful. 2. 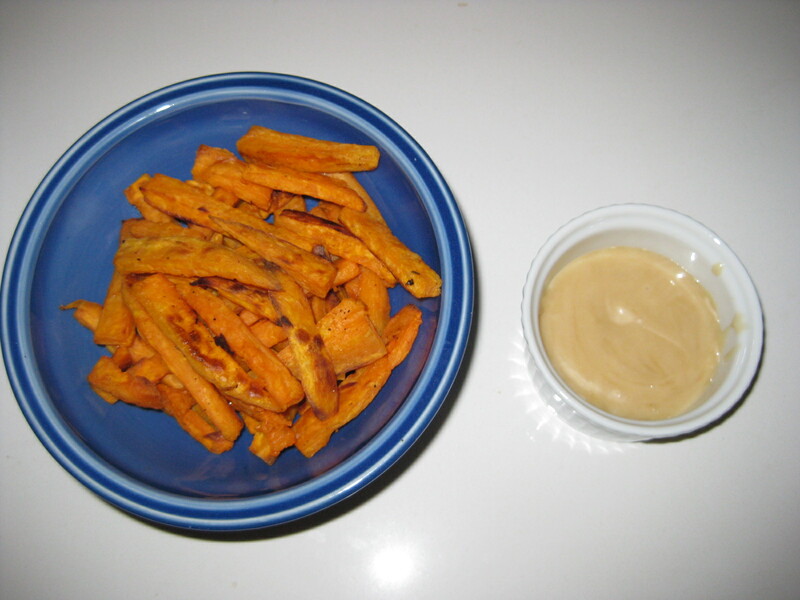 Toss the sweet potato fries with olive oil, Jane’s Krazy Mixed Up Salt or Sea Salt and Pepper. Just enough to coat the fries. You can also add spicy spices here if you want them with a little kick – cayenne, paprika etc. BUT: toss the fries about every :05 minutes. This will help even cooking. 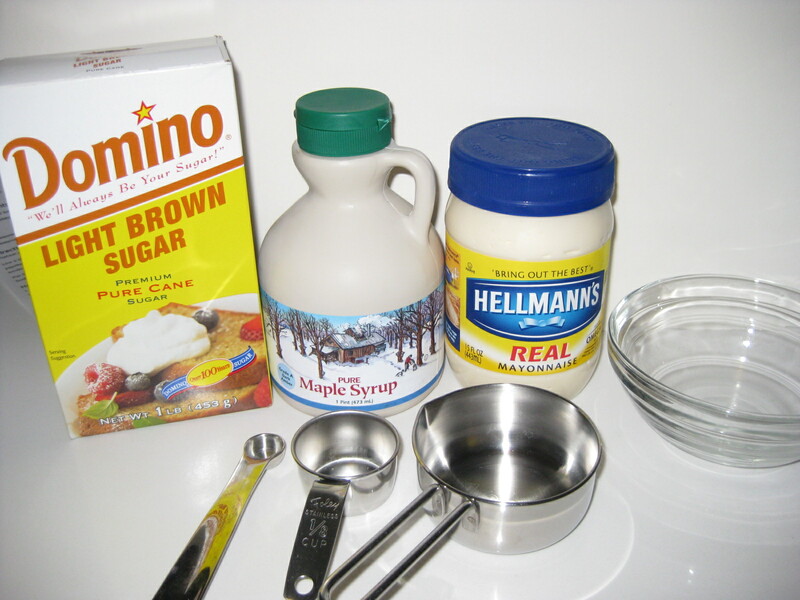 Mix together 1/2 cup of mayonnaise, 1/8 cup of pure maple syrup and 1 1/4 TBSPs of brown sugar. And chill at least :15 mins before serving. Sweet potatoes aren’t just a Superfood, they’re a Super SuperFood. Keep trying them until you find a way to love them. If nothing else, their bright orange color brings newness and energy to your table and can liven up the appearance of any plate. 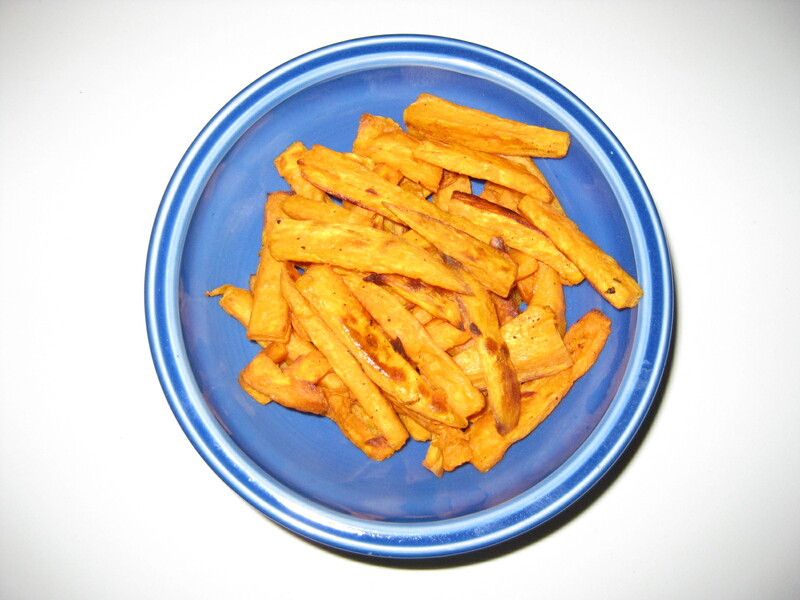 Plus, they can become a fry – yes, you can actually fry them in hot fatty oil, but try not to negate the super-ness and just bake them – would you? 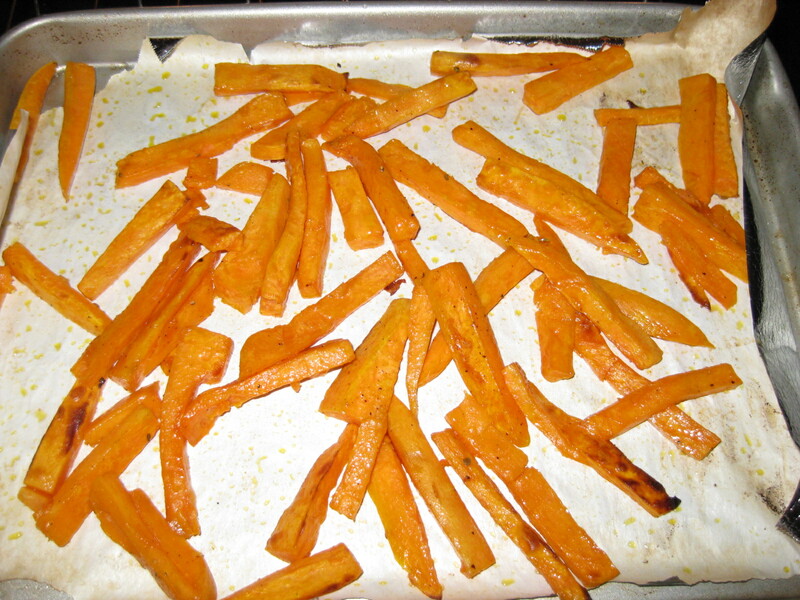 This entry was posted in appetizer, Dinner, Fries, Side Dishes, Super Foods, Vegetables and tagged dinner, food, recipe, Side Dishes, SuperFoods, sweet potato fries, Sweet Potatoes, vegetarian, Vitamins by AnniesDishList. Bookmark the permalink.